Turvec Semi-Vertical Cycle Storage Racks are ideal for places where space is at a premium. They can accommodate any number of bicycles making them the ideal solution for high density parking. 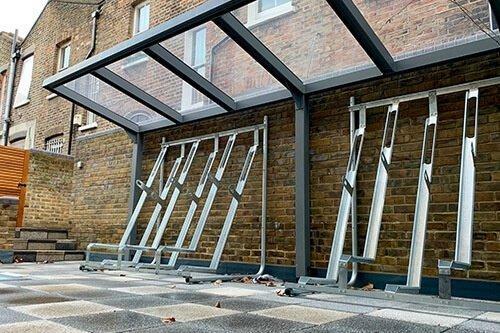 Our heavy-duty bike racks are made from galvanised steel to ensure quality and durability year after year, and are designed to accommodate all types of bicycle. “Thanks for supplying the racks for the apartments, we received a great service and product. Looking forward to using you for our future developments. 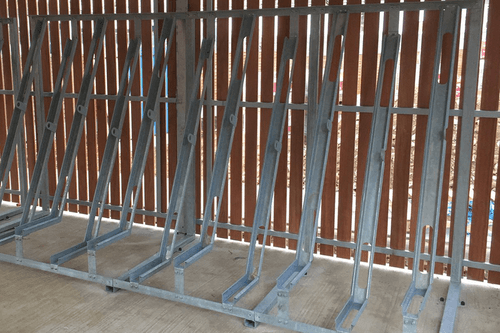 Semi-vertical bike storage racks are supplied in kit form and are assembled on site. Racks can be fixed together to create longer runs of bike storage and require fixing into a suitable surface. Single- and double-sided variants allow us to install semi-vertical racks in tight spaces and within limited height clearance. A flat, level base is a requirement for the installation of semi-vertical racks. Locking points are supplied welded onto the bicycle parking trays to prevent theft following installation. These durable bike racks are galvanised as standard, and can be supplied powder-coated in a range of RAL colours. If a shelter is required we offer a purpose-designed semi-vertical cycle shelter to ensure space-efficiency. Turvec can assist with the planning of a bike store to ensure correct spacing and installation of cycle racks. Semi-vertical racks provide a suitable space-saving solution in areas with limited width or height clearance. Installed in combination with two-tier parking, we can often achieve the planning numbers required for cycle stores in reduced space. Contact our team for assistance in the planning of your cycle store.